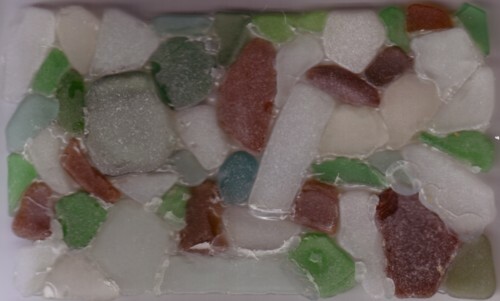 On a day at the beach, several years ago, my daughter and I collected some pieces of glass, that had been smoothed by the sea. You know what I mean: they look like little stones, but they are pieces of broken bottles. They come in three colours: green, brown and white. I kept these pieces of glass in a little box. Last night I used the glass to try out the new glue pistol, that I had bought for a job I had to do today. If I had known it would work out so well, I had collected much more pieces of glass back then! On my way to the houses where I paint, and sometimes in the houses themselves, I often find all kind of stuff. Here are two more CD’s that were lying on the street. they are to damaged to find out what kind of music is on them. Of course, it is not unlikely that one day in the future somebody will find a way to make these CD’s play again. I cannot see why not: at least 75% of the data is still on these CD’s, you only need to find a new way to read them. People have been completed far more difficult things! Here is a song from another CD that I found on the street, yesterday morning. You don’t want to know what a risks I take to grab rescue these things from the Amsterdam traffic. 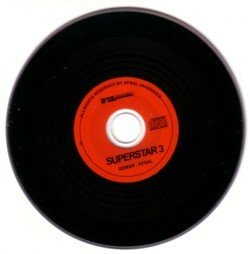 This CD is not a home made CDr, but a Indian compilation called Superstar 3. It doesn’t play entirely as it did before it was thrown (?) out of a car, but it’s enough to give you an impression. Some people never learn: i just forget the right codes! Sorry Jan, but on the other hand: with sound it sure doen’t get much better. (Now listening) ah, I see what you mean. It’s funny though!